Sleep is overrated—at least for The Rock. Dwayne Johnson has released a new app, just in time for his birthday, called The Rock Clock. Described as a “motivational alarm clock,” the app gives users the ability to sync their morning alarm to “Rock Time”—which means you can get up as early as Johnson does. The superstar is usually up around 4 am and finds time to get in a workout at the gym before most of America even wakes up. Now you can do that too. One catch: There’s no snooze button. “Life has no snooze,” Johnson says. The new app brings exclusive video messages from Johnson each day, and has 25 different custom alarm tones created by Johnson to use for an alarm sound. 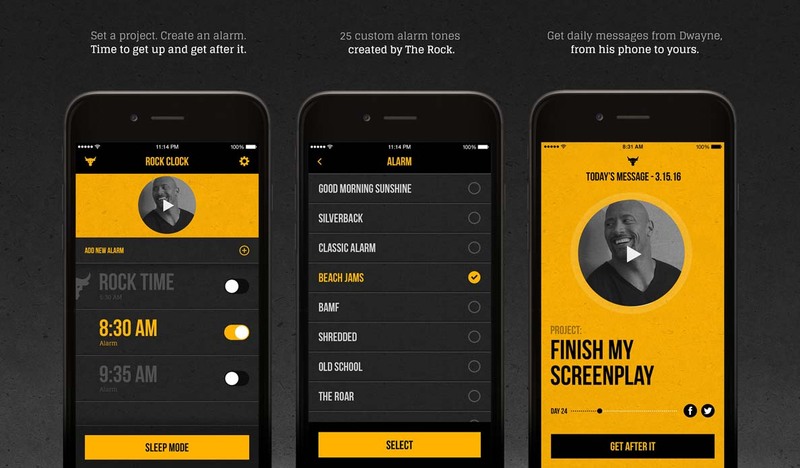 The Rock Clock also allows users to enter a goal—for example “finish my screenplay,” or “go to the gym”—and the clock will push you to try and complete that goal with motivational messages from The Rock himself. The Rock Clock is the latest foray into lifestyle products for Johnson through his Project Rock brand. Things started off with two of the GBOAT (Greatest Bags of All Time), which promptly sold out. Johnson, who turned 44 on Monday, continues to stay in fantastic shape—and he needs to be, as he has a ton different projects coming down the pipeline. Johnson recently wrapped shooting the Baywatch movie with Zac Efron; season two of his HBO show Ballers comes out July 17; Central Intelligence, in which he co-stars with Kevin Hart, was released on June 17; and he’s gearing for up the filming of Fast 8 with Vin Diesel. Even with the busy schedule, Johnson says he is up at “4am daily” and ready to work out. So anyone syncing to Rock Time better be prepared to get up at the crack of dawn—or even sooner.